Wifi Low Power & CommonSense IoT platform 2.0 demo at Embedded World 2017 ! March 14-16th 2017, Nuremberg, Germany. Vertical M2M will exhibit at the leading tradeshow Embedded World in Nuremberg in march 2017 with its partner Beanair, german manufacturer or Wireless Sensors Network (WSN) for a wide range of industrial applications. In 2016, more thatn 30 000 visitors came to meet almost 900 exhibitors reinforcing Embedded World as the leading trade who for embedded and IT systems. With this fair, Vertical M2M is having again one step forward low power for the IoT. 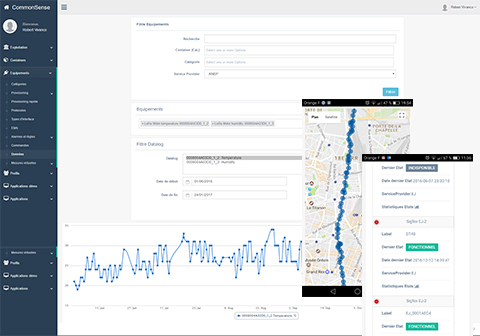 Alongside the advancements with the LoRa protocol, lately with The Things Network at the 3rd meeting of the parisian community for instance, Vertical M2M will demo a Structural Health Monitoring (SHM) application featuring Beanair's Wi-fi Low power equipment. The demo will rely on the CommonSense IoT platform designed for managing multi-technologies network of objects, in its 2.0 version released at the end of january 2017, featuring Beanair's Wilo (Wifi Low Power) equipment range including vibration, inclination and shock sensors. Contact us beforehand to meet each other at the fair !